word for "kiln", is the name of an area within the bay . The hostel and cycle hire will be open again on 26th April 2019. The hostel can accommodate up to 6 people in three private rooms (one room with a double bed and two rooms with bunk beds) . 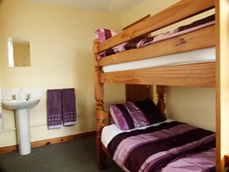 All rooms are on the ground floor with a wash hand basin in each room . 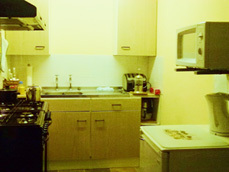 It has full self-catering facilities - gas cookers, a microwave oven and fridge, and has central heating . There is a patio in front of the hostel with a barbecue area - a gas barbecue is provided for the guests to use . 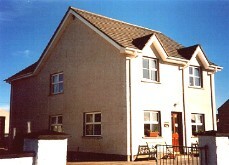 We are only ten minutes walk from the ferry terminal, luggage can be picked up from the ferry by prior arrangement . We are certified by the Northern Ireland Tourist Board . 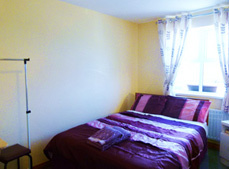 From £20.00 per person per night, inclusive of bed linen, towels and shower. This is established cycle hire business has been run for over 13 years, bicycles to suit all the family. covers from 10.00am – 5pm. The Cycle Hire will be available at any time from 26th April 2019 – bookings possible by email or phone. Cycle hire by booking only. The hostel will re-open on 26th April 2019, cycle hire will also be available from this time. John and Jennifer McCurdy : Phone/Fax : +44 (0) 28 2076 3954. You may wish to use the Currency Conversion facilities at xe.net.